Metal stains, layout fluids, markers, and cleaners from one of the oldest names in Metalworking. WARNING. This product can cause cancer or reproductive harm. For more information please visit www.p65warning.ca.gov. 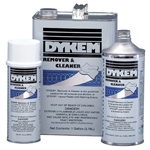 Quickly and efficiently removes Dykem brand layout fluids. No ODC's or tolulene. Will not wash off with coolant Machine shop operators depend on Dykem® Steel Blue Layout Fluids to scribe sharp, clear, precise lines. When applied, our layout fluids provide a uniform deep blue color that prevents glare and dries in minutes. All Dykem® Layout Fluids create an extremely thin film which adds practically no thickness to the work piece and remains flexible without cracking and chipping. Machine shop operators depend on Dykem® Steel Blue Layout Fluids to scribe sharp, clear, precise lines. When applied, our layout fluids provide a uniform deep blue color that prevents glare and dries in minutes. All Dykem® Layout Fluids create an extremely thin film which adds practically no thickness to the work piece and remains flexible without cracking and chipping. Machine shop operators depend on Dykem® Steel Blue Layout Fluids to scribe sharp, clear, precise lines. When applied, our layout fluids provide a uniform deep blue color that prevents glare and dries in minutes. All Dykem® Layout Fluids create an extremely thin film which adds practically no thickness to the work piece and remains flexible without cracking and chipping. Will not wash off with coolant Nine cleaning uses in one cleaner! Nine cleaning uses in one cleaner! Nine cleaning uses in one cleaner!